When we seek help from a medical professional, we count on them to faithfully execute their duty of care. Tragically, doctors and other healthcare providers make mistakes all the time and sometimes, these medical errors cause irreparable harm. In the field of medical malpractice, the term “Never Event” is often used to refer to adverse events that simply should never occur. The NQF categorizes Never Events into 7 key areas: surgical, product or device, patient protection, care management, environmental, radiologic, and criminal. Some of the leading Never Event categories are explained in greater detail below. 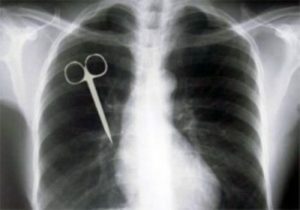 Surgical events include performing surgery on the wrong patient, operating on the wrong body part, removing the wrong organ, leaving a foreign object inside the patient during surgery or another medical procedure, and death during surgery or immediately postoperative in a completely healthy patient. Believe it or not, these events do happen and are often caused by issues with patient charts and medical records. If the surgeon receives the wrong information about the medical procedure to be performed or the person he or she is operating on, surgical never events can lead to serious injuries or even death. As for leaving foreign objects in the patient during surgery, a variety of surgical tools, gauze, gloves, clamps, and other items may be left inside the body. This is why it is imperative for surgeons, nurses, and other medical professionals to thoroughly inspect the surgical site before closing. Never events involving products and devices may result from contaminated devices or medications provided by the health care setting, such as injuries caused by unsterilized tools. These serious injuries may also be caused by a medical provider who recommends or employs a product or device for an unintended use. It is the duty of the health care facility to follow appropriate protocol when dealing with patients who are unable to make their own decisions. This includes infants and minors, as well as elderly patients with dementia and other individuals who are under another party’s care. Patient protection never events may occur when a patient is discharged or released to an unauthorized person; if the patient disappears and experiences a serious injury or death; or if a patient with a serious disability under the care of a health care facility self-harms, attempts suicide, or kills themself. Although medical malpractice never events are relatively rare, the consequences of these egregious medical errors are often catastrophic, if not deadly. In fact, according to recent data, 71% of never events reported to the Joint Commission proved fatal over a 12 year period. Additionally, one research study in 2013 estimated that every year, over 4000 surgical never events happen to patients in the U.S. If you or someone you love suffered serious injury or death as a result of one of the actions considered a Never Event, you should know that you can pursue legal action against those responsible. At Fronzuto Law Group, our New Jersey medical malpractice attorneys represent victims of all forms of Never Events, ranging from maternal death and birth injuries to death or injury in elder care facilities. To speak with an experienced NJ medical negligence lawyer about your rights, contact our office at 973-435-4551 or fill out our online form. We provide consultations absolutely free of charge.